The luckiest people on Canada Day are those who live in condos close to the downtown fireworks. 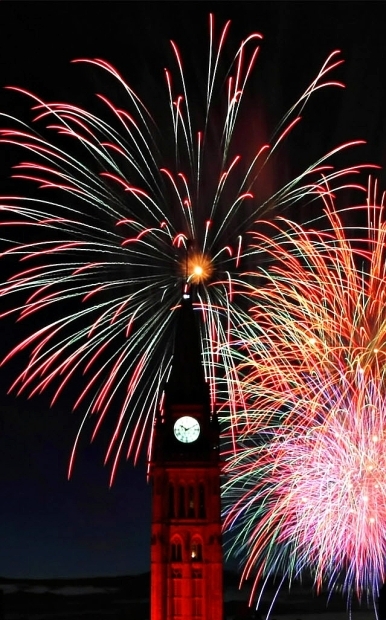 OTTAWA — As we approach July 1, it’s time to think of how best to celebrate. Though living in a condo might alter the plans of the traditional barbecue, it does not mean that you will have to forgo your festivities. So pull out your patriotic gear and prepare for a condo-perfect Canada Day. Now is the season for backyard barbecues, poolside margaritas and lying around in Adirondack chairs. But for those living in condos, summer entertaining can become even easier and more spirited, especially this Canada Day. Rather than bemoan the fact that you are relegated to the indoors, consider that you have a whole building full of friends with which to celebrate. Start the day with a lively outfit of red and white and head to Parliament Hill, where the festivities include music from well-known Canadian artists. This year’s lineup lists Carly Rae Jepsen and Metric, among others. Astronaut Chris Hadfield is also scheduled to appear. After you’ve enjoyed the sea of red and white, head home for the main event. Consider organizing a “condo crawl”, a fantastic way of optimizing your celebratory space. What is a condo crawl? Start with wine or cocktails in one unit, move to appetizers in the next, and don’t forget to watch fireworks from the unit with the best view. You may even consider having a potluck in a condo unit or common space. If you’d rather host a private party, keep it themed and invite a few close friends. Before guests arrive, assign a designated driver. Encourage spirit with a prize for most patriotic dress, and feature red velvet cupcakes and cookies in maple leaf shapes (Le Moulin de Provence in the ByWard Market is the best place to pick them up). Drink-wise, mix up RCMPitos — Canada Day mojitos in disguise — or a traditional Prince of Wales, invented by King Edward VII. For kids, root beer floats are festive. Instead of a cherry, stick a small flag on top. Rules for barbecuing are specific to your condo, however, instead of an outdoor grill you may prefer a George Foreman. This will make things simpler for you when balancing party and prep time. Instead of being stuck on a balcony alone while the party happens, you will be in the heart of the action. If you have a lot of guests on a balcony, opt for reusable plastic cups. This will be safer in case anything falls or breaks due to the restricted space. Local dollar stores are great places to pick up low-cost decorations, including festive cups and flags. The luckiest people on Canada Day are those who live in any condos close to the fireworks display. As 10 p.m. rolls around, turn out the lights and prepare to be dazzled. Obviously, condos in the ByWard Market offer views. I’ve personally enjoyed fireworks from the NAC rooftop — a superb spectacle similar to the one afforded by these condos. Many buildings further from the site of ignition also see it all. Frankly, no matter how little you see, all that matters is that you’re with your friends and neighbours. That being said, you may want to check out Cathedral Hill by Windmill Development Group as it’s the next up-and-coming condo that will offer perfect Canada Day views. But wherever you end up this Canada Day, take a moment to appreciate our “glorious and free” nation. Happy Canada Day!